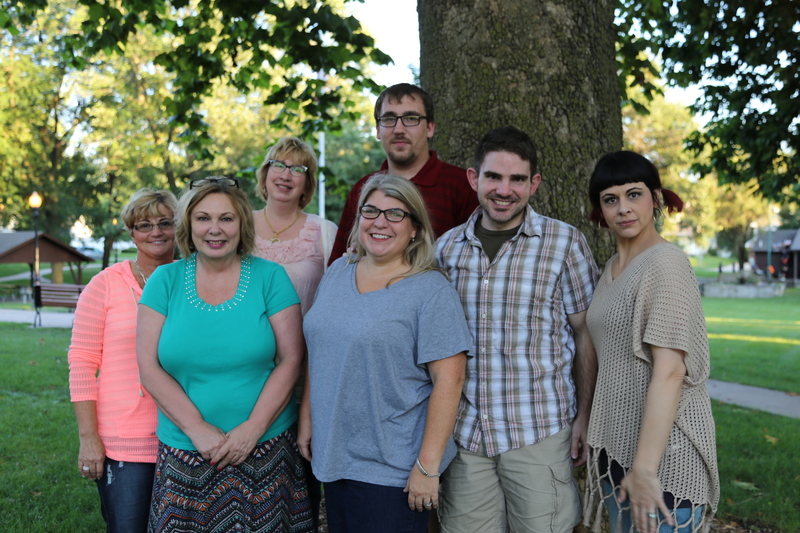 Union Street Players gathered at West Market Park on Monday evening, August 10, for the annual membership meeting and potluck picnic. This has been an annual event the past few years and this year’s crowd was bigger than ever with over 50 people in attendance. Under the canopy of the north shelter, after everyone had enjoyed the feast, the annual meeting was held. 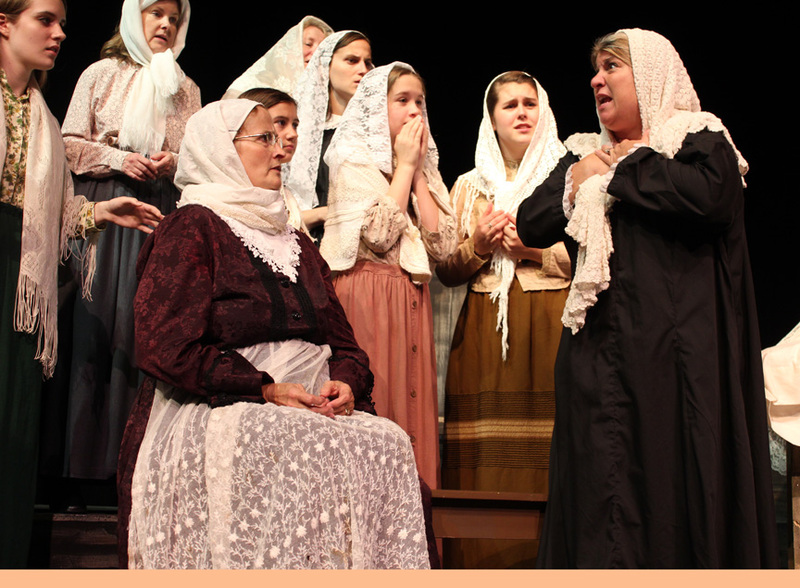 Carolyn Scharff (seated on left) played Yente in this summer’s “Fiddler on the Roof.” She will be honored as this year’s inductee in the USP Walk of Fame. During the meeting, the USP Board of Directors announced that this year’s inductee to the USP Walk of Fame will be founding USP member, Carolyn Scharff. Scharff has served USP faithfully on and off stage over the years. She will be inducted at USP’s annual Award’s night held at the Pella Opera House on October 3rd at 6:30 p.m.
YTD USP is at nearly a $13,000 in the black. As a non-profit USP is not in business to make money, but wise fiscal management and profitable productions allow us to reinvest in our facilities, improve our productions, and provide opportunities that further our mission. USP received a record $14,173 in patron support. USP welcomed Don Graves into the USP Walk of Fame in October of 2014. USP added new audio equipment (gift from Pella Shakespeare) and new LED lighting instruments. The Costume Shop led by Pati Van Zante and the Costume Shop Committee updated flooring, cleaned and organized, set new rules for school rentals, and continued to provide costumes for area productions. Thanks to the hard work of Vice-President, Deb Linn, we made $5100 in advertising income and covered all of our program costs. For the first time we welcomed a sponsor other than the Pella Community Center, Hopkins Roofing who sponsored Fiddler on the Roof. Once gain, thanks to Brystal Hopkins and Suzi Jones, USP Drama Camp was a bigger success than ever with more kids than ever. Offering classes two sessions of classes for over 120 campers. While the composition of the Board has changed, USP will continue to benefit from solid, veteran leadership. Deb Linn, Mark Schaefer, and Cody Kooi are continuing in their positions. Cyndi Atkins, Denise Gregory, and Jana De Zwarte have served on the Board in prior years. Kim Beyer is the only new officer who has never served on the Board before. New Board members will begin their tenures on September 1. USP’s next meeting is Monday, September 14th at 7:00 in the Pella Community Center. Everyone is welcome at USP’s monthly meetings, though you must be a member to vote. Annual membership in the organization is $10 for adults and $5 for junior members. Previous postMozeltov! USPs “Fiddler on the Roof” a Success!